GraffitiStreet headed down to Leake street ‘Banksy Tunnel’ Waterloo, London on International Woman’s Day to check out the second Femme Fierce event, ‘Reloaded’. 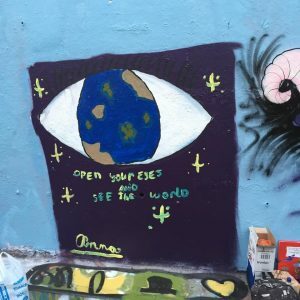 Femme Fierce is all about highlighting and encouraging women into the street art scene and this year they were raising money and awareness for PlanUk…Because I am a girl campaign. GraffitiStreet arrived on the morning of International Woman’s Day to a ‘Blue Banksy Tunnel’. There was already a buzz, and aerosol, in the air as the female artists didn’t waste any time bombing the walls. With over one hundred and fifty female street artists involved, Femme Fierce Reloaded was one jam packed event. With a serious amount of aerosol spray at the ready, GraffitiStreet couldn’t wait to see colour get on those blue walls. Walking through the tunnel we got to see live action from all sides. As the day went on more and more visitors came to check out the skills of the Femme Fierce female take over team in action. With live music, impromptu MC ing , a great atmosphere , and great talent, this was a Sunday not to be missed. The murals started to complete late afternoon and the artists could relax and chat to the many visitors now taking over the ‘Banksy’ tunnel! The Femme Fierce event was not just about the aesthetics of street art murals by women but also to raise money, and much needed awareness, for PlanUk…Because I am a girl campaign. This campaign works to stop violence against women and girls, with a focus on ending FGM and child marriage . These issues are still being experienced by too many vulnerable girls all over the world today. PlanUk fights for their rights. There was a lot of support for Noble peace prize winner, Malala Yousafzai. We saw Argentinian street artist Fio Silva, the winner of the Spring Projects ‘Next Big Thing’. (A search for an international street artist to be flown to Europe and paint at Femme Fierce Reloaded). Fio Silva unique style of creating a creature that is a combination of varying organic, fluid and natural components flows perfectly to depict a Rhino. Congratulations to Hannah Adamaszek. Who is the Winner of the most spectacular piece of the day as judged by Femme Fierce. Finally a shout out to Anna who is 8 years old. Wise words from such a young girl. I think you will agree there was a serious amount of talent this year. The event was fun, relaxed, with a great vibe. Femme fierce all girl takeover is already planned for next year! and GraffitiStreet will definitely be there! GraffitiStreet would like to say a massive congratulations to Ayaan for an excellent event and to all the uber talented and friendly artists working hard throughout the day. We wish Plan UK the best of luck for such a worthwhile campaign. You can donate to this charity here. Photos by GraffitiStreet Team of the day: Donna Haden, Rosh Boroumand and Sameer Gangoli. A self confessed street art blogaholic!